Genting are a famous casino brand worldwide and they have used their gaming expertise to create GentingBet, a first-class sports betting service that covers a wide range of sports, along with several promotions and a streamlined In-Play facility. New customers are able to enjoy a welcome bonus when they first register an account; with GentingBet offering £10 First Bet Insurance that means you will get a free bet if your first settled bet doesn’t win. It’s a great way of getting started with an operator who are licensed in the UK. We like the idea of a risk-free bet to get started with an operator and GentingBet certainly tick this box with £10 First Bet Insurance. Simply place a £10 bet at evens (2.0) or bigger and this bookmaker will give you a £10 free bet if it loses. 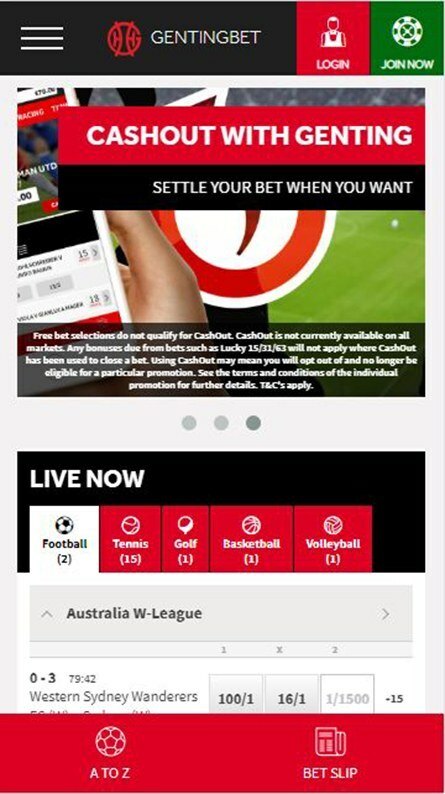 This free bet can then be used on another sports betting market. There are certainly lots of markets from which to choose, whether you like betting on football, horse racing, tennis or any number of other sports that you will find available at the GentingBet website. There are Quick Links that can transport you directly to the events that are proving the most popular. 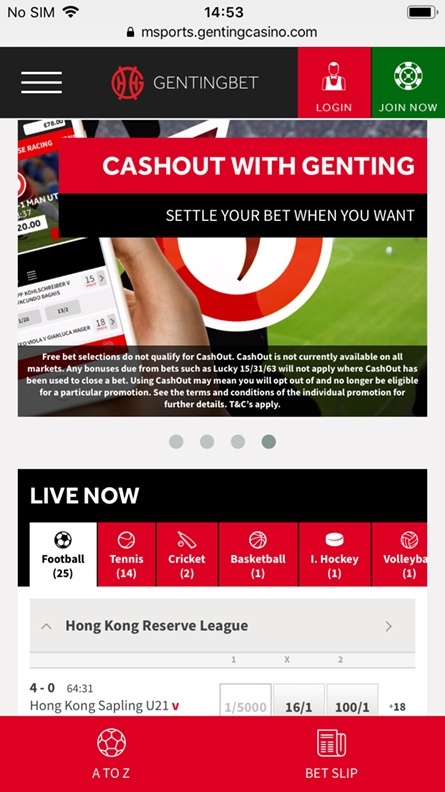 The sheer volume of football leagues covered is highly impressive, with GentingBet offering competitive odds for each of them, although you will find the prices at their most generous for customers when it comes to the more mainstream divisions such as Premier League, Serie A and Bundesliga. What’s refreshing is that GentingBet offer daily price boosts for existing customers rather than the operators who serve these up for new customers only. It’s great to get the opportunity to back football teams at inflated odds and try to land some value accordingly. Most price boosts are capped at a £10 maximum stake because GentingBet are offering a bigger price than other operators, so be sure to take a look at the daily specials before placing a bet. If you have written down a selection, you will nearly always get the biggest price with these boosts. There is also a GentingBet blog where you can get the lowdown on the latest sporting events taking place, with the previews outlining the latest betting trends and also some recommendations for what you might want to be backing each time. GentingBet are no slouches when it comes to horse racing in the UK and Ireland, with this bookmaker up nice and early with their prices every day and they’re also one of the bookmakers who are committed to Best Odds Guaranteed for every single race. Bets must be placed between midday and 9.30pm on the day of the actual race to qualify for Best Odds Guaranteed, with the maximum bet per race capped at £2000 that means that customers with any type of bankroll can benefit from this excellent concession. GentingBet uses the Genting Casino Cashier to facilitate payments and, as you might expect, it accepts the most popular payment methods. All deposits are free of charge and we’ve been impressed by how quickly bets are settled and then withdrawals are processed back to our bank account. When using a debit or credit card, customers are required to make a minimum deposit of £10 and GentingBet will seek to verify your identity as part of the KYC recommendations. Once you have validated this by sending over a copy of passport or driving licence, then the payment process should be seamless. While GentingBet offers a first-class betting service, there’s no getting away from Genting’s Casino being the real jewel in the crown for this operator, with the company having a swathe of land-based casinos dotted around different parts of the world and this is what the brand is the most synonymous with. Genting Casino offer a new player welcome bonus with a difference. You can deposit up to £200 and enjoy a 100% match bonus which effectively can give you a grand total of £400 in your account which is a double money bankroll when you first get started. Not only that, but you can also enjoy 20 Free Spins on the Dream Catcher game which is a new wave type of casino experience and involves customers having to choose freely what number they think a giant wheel will stop on. You can drag and drop casino chips on to a board and enjoy the immersive experience of being in a real life TV show. Indeed, the Genting Casino make the most of having their bricks and mortar establishments to offer a range of live experiences, with Roulette Live coming from major casinos in Manchester and Birmingham where customers can enjoy that dynamic live experience while playing on their phone. Fancy playing in Las Vegas? Genting Casino also gives you the chance to play Vegas Roulette where the wheel of steel is spun in a land-based Las Vegas casino. A real life croupier is on hand to call the bets and you simply place your bets accordingly and hope to see the right numbers come up. The game has a theoretical return of nearly 95% which makes it one of the best to play. Genting are big on customer loyalty and you can convert your Genting Points into cash when you play at the casino. You start earning these as soon as you start playing games, with Points being turned into cash which will boost your bankroll when it comes to playing live dealer or online slot games.